I thought I had seen the end of it last March, when AMS Performance’s Alpha G GT-R ran a quarter-mile in 6.937 seconds at 196.27 mph. I thought wrong. 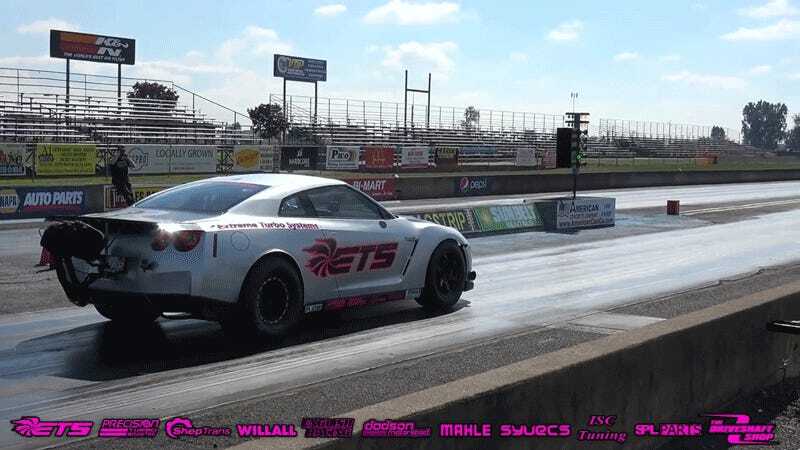 This past weekend, Extreme Turbo Systems ran its own GT-R at the Woodburn Dragstrip in Oregon. On the car’s third run, it hit a quarter mile in 6.88 seconds at 222.93 mph. It’s made even more harrowing after you see the hairy second run, when they upped the boost higher than they ever had and then the car lost traction in all four tires, coming within inches of crashing into the wall. Thankfully, though, nothing bad happened and they were able to run the third and record-breaking run. Carscoops estimates that ETS’s GT-R makes north of 3,000 horsepower. ETS itself uploaded a video of its GT-R at the dyno; it made a touch over 2,700 horsepower at the wheels. So, yes, it’s definitely making at least 3,000 at the crank. I don’t even have any concept of what that is in a car at those figures. Three thousand horsepower? My god. Remember When Nissan Told People Not To Modify The GT-R?